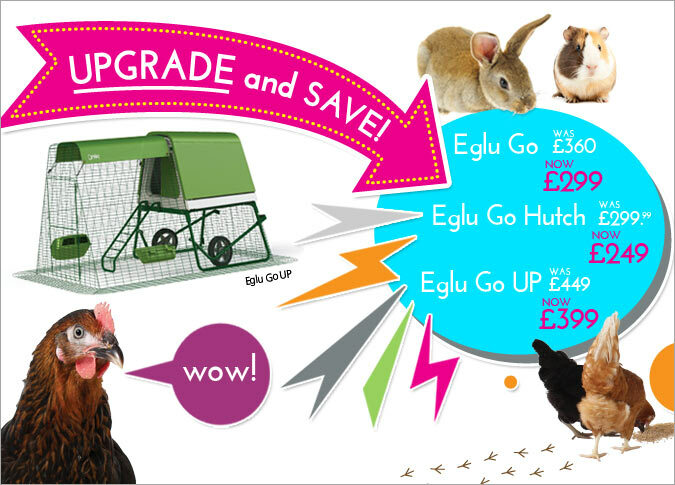 Save over 10% on Eglus with the Omlet Upgrade Scheme! Email not displaying correctly? Click here to view in your browser! Happy New Year! Are you looking out the window at the cold, wet and miserable weather but feeling wam and snug in your lovely home? Are you sure your pet is feeling just as cosy as you? Is their home looking a bit more Fawlty Towers than Buckingham Palace? Could it be time for an upgrade? Then don’t miss out on this very special offer. Order a new home for your pet this month and save over 10%! Click here to choose your upgrade product today! This offer is not valid in conjunction with any other Omlet offer. The offer expires at 11:59pm on 31st January 2016. Offer applies to UK orders only. Previous purchases are not eligible for this offer.